O God, who see how your people faithfully await the feast of the Lord's Nativity, enable us, we pray, to attain the joys of so great a salvation and to celebrate them always with solemn worship and glad rejoicing. Through our Lord Jesus Christ, your Son, who lives and reigns with you in the unity of the Holy Spirit, one God, for ever and ever. The feast of St. John of the Cross, which is ordinarily celebrated today, is superseded by the Sunday liturgy. Evidently, in the mind of holy Church, neither the prophecy concerning Bethlehem Ephrata nor its fulfillment in the day of Caesar Augustus is to be considered merely a glorious divine disposition and achievement. No, the prophecy of Micheus is still being verified every day, but predominantly during the annual Advent season; for the selfsame incarnate eternal Son of God who journeyed to Bethlehem to be born there physically, now to the end of time comes to human souls as to spiritual Bethlehems, there to be born anew, again and again. But be sure to picture these merciful spiritual journeyings of Christ to the Bethlehem of souls as all too often sadly realistic spiritual repetitions of His first long journey over the rugged road from Nazareth to Bethlehem. Meditate long on the wanton and malicious opposition He encounters on His way to them from souls that leave their senses and heart and mind to be ruled by earthly vanities, and their whole selves to be willing victims of the sensual and selfish illusions and witcheries of the seven capital vices. Can you still fail to see why Isaias and the Baptist compare the hardships of the way of the world's Messiah-King to souls with a rough, crooked, and almost impassable road up steep hills and down precipitous valleys and through dangerous mountain passes? Do you wonder that these prophets of His coming insist so strongly that merely sentimental longings and routine prayers, however multiplied, cannot prepare us worthily for the entrance He must expect and the welcome He craves? "Prepare ye the way of the Lord: Make straight in the wilderness His paths; Every valley shall be exalted; Every mountain and hill shall be made low; And the crooked shall be made straight; And the rough ways plain" (Is. 40:3, 4). Then shall you see the salvation of God! Excerpted from Our Way to the Father by Rev. Leo M. Krenz, S.J. 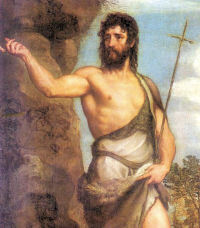 "I (John) am the voice of one crying in the desert,. . .but (pointing to Christ) in the midst of you there has stood One Whom you do not know" (Gospel). This is known as "Rejoice" Sunday, from the opening word of the Introit. Despite our self-praised progress, real joy is missing from modern life. In such a "desert" we must look to Christ. Only He can "bring light to the darkness of our minds" (Prayer). Only He can bless, deliver and forgive (Offertory). Only He can "say to the faint-hearted, 'Take courage'" (Communion Verse). During these days before Christmas "have no anxiety" about selecting or receiving mere tinsel gifts, but prepare "in. . .prayer. . .with thanksgiving" and "guard. . .your minds in Christ," the true source of our joy (Epistle).